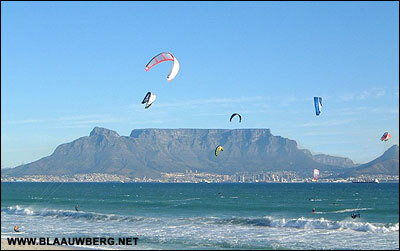 Welcome to your one-stop site for all your kitesurfing and watersport needs in Cape Town, especially in the Blaauwberg area. This site serves as a medium for locals to access all the information they need and for our foreign kitesurfing community who are coming on kitesurfing holidays. For foreign visitors, you are welcome to use this site to find accommodation, car hire, restaurants, tour operators and any other information you require. Kitesurfing is the fastest growing extreme sport in the world with even 007 giving it a pseudo bash in "Die Another Day". The thrill is undeniable, the addiction level 100%. Dolphin Beach in Blaauwberg, Cape Town, is now on the international map as one of the world's premier kitesurfing hot spots. With side-shore winds averaging 10-30 knots from the South East, a wide spacious beach perfect for rigging, launching and landing kites and an unforgettable picture postcard view of Table Mountain, this is without a doubt THE place to ride. And this is exactly what scores of adrenaline-fuelled riders consistently do as they take to the wind & waves in pursuit of the ultimate high. This might come in the form of some gravity defying Hang Time, with the world record holding at over 8 seconds in the air - or a perfect Forward Loop Grab, one of the countless tricks possible for anyone with time, talent and a little bit of money on their hands.